You have reached an inactive product page for The Passion Translation, New Testament. Please see our new version of this product including Isaiah here. The Passion Translation Bible expresses God’s fiery heart of love to this generation using Hebrew, Greek, and Aramaic manuscripts—merging the emotion and life-changing truth of God’s Word. Now, the Passion Translation New Testament contains not only the ENTIRE New Testament, but also Psalms, Proverbs, and Song of Songs! Note: Translating the original, life-changing message of God’s Word for modern readers, the text will italicize certain words or phrases for the sake of narrative clarity and to better convey the meaning of God’s Word. Although these highlighted portions are not in the original Hebrew, Greek, or Aramaic manuscripts, they may be implied from the context. Additionally, certain names have been translated in their original Hebrew or Greek form. 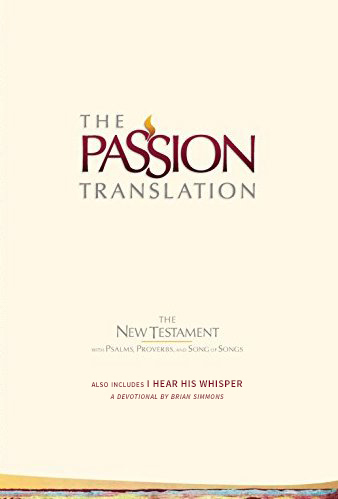 BONUS: Olive Tree users who purchase the Passion Translation New Testament will also receive I Hear His Whisper, an enhanced devotional by the author of the Passion Translation, Brian Simmons. UPGRADE PRICING: If you've previously purchased any volume of the Passion Translation, we are able to provide the Passion Translation New Testament at no additional cost. The free upgrade will be visible when you log in to your Olive Tree account and add the item to your cart (NOTE: the free upgrade is only available on olivetree.com, and not via in-app purchase).